Animate fight motions, choreograph group animations, bring to life any animal or creature! 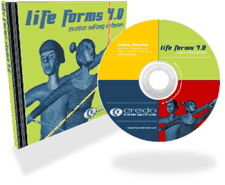 Life Forms software was originally conceived in 1991. It quickly became the premiere 3D software package dedicated specifically to character animation. Since then it has earned worldwide notoriety as a simple, flexible, intuitive animation package. Animate bipeds, quadrupeds or even sea-brine! Keyframe your animations in Life Forms or bring in motion-capture data to blend together sequences. Animate any model with a hierarchichal skeleton or hierarchichal segments: bipeds, quadrupeds or even sea brine - whether you're dealing with two, four or multitudes of limbs. With Life Forms Studio, you're not limited to one application - benefit from the smooth integration into your favorite 3D packages. Read / write HTR, BVA, BVH, LWS, DXF, ACC (Acclaim), 3DS, LFA (Life Forms) file formats. New Plugins allow LFA files to be read into Maya and 3D Studio Max.The improved Joint Map Editor allows you to assign motion from one motion file to another or from one model to another. The Batch Convertor gives you the capability to convert entire folders of motion files to the format of your choice. Life Forms Studio includes over 750 motion files  including 150 mocap files  ready to use in Life Forms! And if you're looking for more options, don't forget to check out our entire product line of ready-to-use models, mocap and more.